So I came up with a submission–and in German! 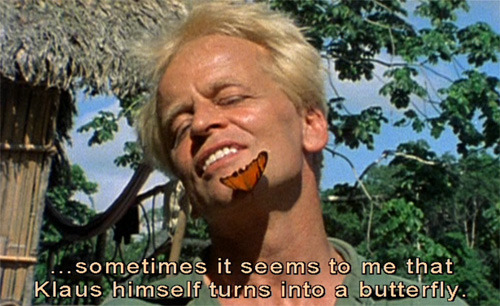 “Kinski Butterfly” is more of a poem than a song, I fear. It stole a bit from thinking about opera because of Fitzcarraldo, and from Marlene and Weill — trying to do something in that sort of vein with my, erm, very limited abilities. But that’s how my brain works (if it does). Once I see a thing in my head, I want to make it real. Every random thing that’s caught my attention might show up. It’s all part of the process. Everything, however seemingly random or insignificant (or immense and significant), that goes in my head becomes part of the creative process. And I end up doing rather frightening things that I never thought I’d try — I know it’s not exactly leaping from a tall building, but sometimes the little braveries have a big impact on one’s own life. We’ll see how it turns out once Richard releases the collection on Xmas Eve.